A&D Australasia’s Weighing Division recently solved a problem for a large local plastics manufacturer based in Melbourne. This manufacturer produces scores of plastic pipeline for many high profile companies and projects which include: water and waste water plants, mining and mineral processing, food processing companies, power stations, hospitals, schools, and high rise developments just to name a few. Being a leader in their industry and priding themselves on constantly improving their manufacturing processes to increase efficiencies whilst adhering to quality systems that conforms to Australian Standards, this manufacturer wanted to find a faster and more cost effective method of measuring the moisture content in their pellets of polypropylene plastic which is used to manufacture their plastic pipelines. Looking to move away from their current time consuming titration method which often requires costly specialized equipment, the manufacturer purchased an A&D Advanced Moisture Balance with SRA (Secondary Radiation Assist) Technology and are now able to get accurate moisture content measurements in a much shorter time. 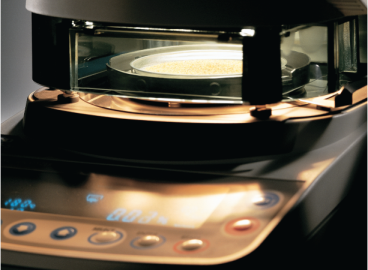 Faster and uniform moisture measurement with halogen lamp and innovative SRA technology. Huge cost savings because the customer no longer needed to purchase replacement specialised titration equipment. If required, live moisture data can be graphed to a PC using A&D’s WIN CT moisture software. Locally supported moisture analysers which can easily be serviced by their local scale service provider. A&D Australasia continue to prove that economical, Australian designed and manufactured solutions are a vital resource for local industry now and into the future.